Pollen Trio is an elusive and facetiously meek name for a band which is anything but meek. 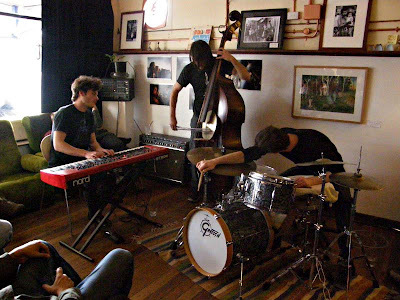 It’s actually the Austin Benjamin Trio renamed, but the music has moved since their first album, and it seems to continually be seeking new natures. Their performance at JU surprised me with a minimalist challenge for the afternoon radio audience. This Front gig was a little more aligned with the CD, but also more bombastic, with powered, repetitive figures that could be mistaken for free, until you encountered various starts and stops and obviously programmed bars and unison lines that stitched the parts together. There’s lots of repetition at high energy, some quite understated minimalist soloing and always that push and drive that’s the nature and intent from the top. Austin leads with a strangely effected Nord piano sound. A friend wondered why he used this tone, but to me it fits the manic style perfectly well. 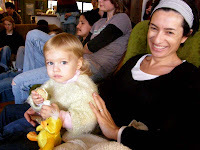 This is not an audio space for gentleness or hesitation. It seems post apocalyptic, informed by sci-fi thrillers, but with a sense of purpose and seriousness and threatening reality. Chris admirably holds bass duties and dropped in a few melodic lines with precision, but this is a repetitive although challenging bass role. 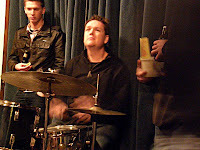 I particularly enjoyed Evan’s drumming, here at its most involved and committed. Body flailing, sticks and mallets touching or beating with these movements. He’s a very mobile and expressive player. Passages that hinted of drum solo with a repeated riff from the band, but I wasn’t quite sure if it was full on solo or busy accompaniment. It was all mesmeric repetition and sustained odd time signatures. I thought I counted 5/4 and an oddly syncopated 8 and 7/4 and a 16 divided into 9 and 7. But the times were not easy to count, so perhaps I’ve erred. This intensity says menace and no prisoners, but an unexpected lullaby theme appeared in Chase the clouds. So, intriguing and involving and another worthy expression from this inventive outfit. Pollen Trio. I like the name. Despite the lullaby, it’s a delightful disparity from the music. 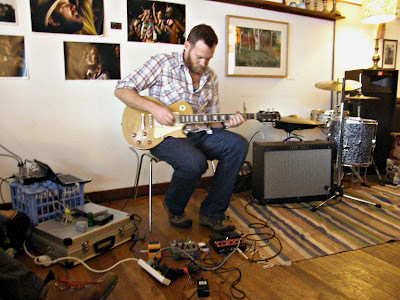 But lullaby was a clearer theme of the second performer, the Sydney-based ambient guitarist, Seaworthy (AKA Cameron Webb). Why lullaby? Firstly, because I heard those simple, satisfying melodies in this guitar playing, and ambient seems to me a modern day lullaby for adults. Secondly, because his toddler daughter was there for the performance, and delightfully interrupted it at one point. (There’s no interrupting headstrong toddlers!) This was true ambient music. Simple themes and instrumental performance, supported by an array of tools of the trade (PC and effects and loops and echoes) and assisted by background soundscapes. Cam played two tunes (he normally plays a single long piece, but it was two this day due to the interruption). The first was against sounds of seagulls; the second against footfalls in an identifiably dull, reverberant space. Apparently he’d recorded this in concrete bunkers discarded the Navy. You could hear these reflections in cement, somewhat like a Canberra underpass but bumpier. This music was simpler than Pollen’s, but hypnotic and quite seductive. So two versions of lullaby; two versions of hypnotic music. They were very different, but an interesting combination and well received. Also interesting was the neat little business card CD with tracks from each of the bands that you were given with the cover charge. Never seen that before. 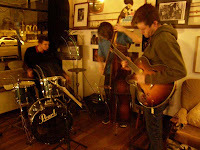 Pollen Trio were Austin Buckett (piano), Chris Pound (bass) and Evan Dorrian (drums). Seaworthy was a one man band comprising Cameron Webb. 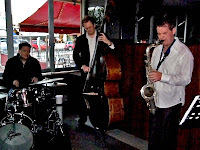 It was the far reaches of jazz that attracted me to the Front for Melbourne’s mandala. 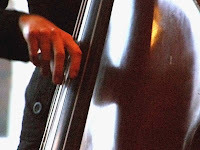 I wasn’t sure what to expect, but there was no bassist, so it was an unusual combination, and the descriptions were intriguing: “where improvisation and composition interact”, “like a dog with a bone”, “avant-guard sensibilities … Headhunters moments … post-modern blaze”. Sounds good, and it was. This was a trio of drums, guitar and piano, with trumpet as special guest. Music that morphs throughout, as different instruments search for a new exposition, or sit and explore a riff awaiting development. The trio had played together lots, so there was closeness and responsiveness and expectation; a level of comfort with very demanding but undefined musical outpourings. Miro on trumpet waited a little more to hear the grooves and harmonies, but his playing was spot on for this band. (I was thinking: the Europeans do chaos superbly!) Trumpet seems so apt for this freedom, floating or flying sharp and clear over the energetic understory. Ronny on drums could be furious, loud with a sharp snare, rabid rock or other grooves, then descending to cymbals and percussive sounds. Geoff remained calm, but was fast and loud and tingling with his sharp Telecaster tone, sometimes echoed or otherwise effected. Sometimes a guitar solo, sometimes in the low registers with an e-bass mentality, sometimes string tones or even explosions of a guitar neck dropped a few inches into his lap. No damage to the guitar, but a clear challenge to the mainstream. Marc was wondrous at times, classically concentrated and straight backed, starting one tune with minutes of rhythmic searching on the slightest of melodic ideas: a tonic to a minor third. His piano tone (was it a Rhodes tone?) was breaking up with power at times. 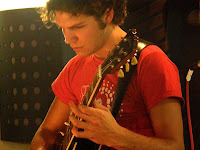 Othertimes, bell-like for contrapuntal passages at 4 or 5 octave intervals between left and right (he seemed to like these), or deep when taking a bass role, or ecstatic with lengthy, rapid modal solos that raged over hard rock grooves and guitar hardness, perhaps with that souring trumpet wailing above. This was music that morphed constantly, free, rabidly energetic, loud, frenetic, but always displaying chops and sensibility despite the instantly formed expression. Pure improv; no charts. Just sounds sprayed around and reacted to. What did they play? It was fully improvised so no titles, but I can report that they performed four improvs over two sets. It’s not for the faint of heart, but if you know the language and hear the patter, it’s a thing of passion and beauty. 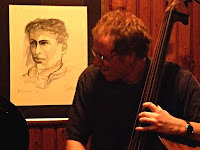 The Andy Campbell Trio introduced the night, but I only heard the last bars of the last tune. Just enough time for one blurred pic. 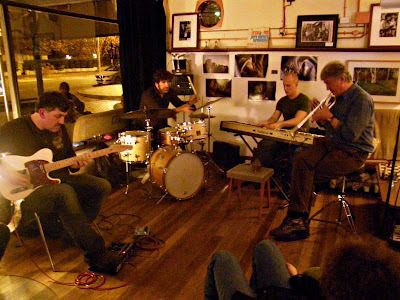 Mandala is an improvising trio from Melbourne comprising Ronny Ferella (drums), Marc Hannaford (piano) and Geoff Hughes (guitar). 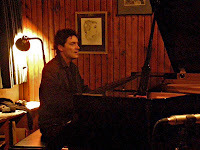 Miroslav Bukovsky was the special guest at the Front Cafe. 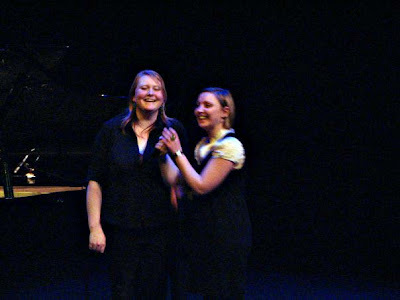 Sally Greenaway held her London Evolution concert at the Street Theatre the other night. I missed it for family reasons, and it seems like I missed a beauty. 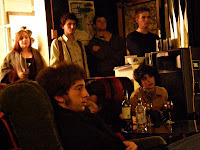 Over 100 musos played for a full house, in various formats and bands and styles. Thankfully, ArtSound recorded the night, and we’ll be hearing it sometime soon on Friday Night Live. Till then, I have to be satisfied with pics and a blog post (with the full program). Sally is evolving to study film composition at the Royal College of Music in London. She’s got a great history already, composing and arranging for numerous bands and styles, and even winning the inaugural National Big Band Composition Competition (what a title!) with the JazzGroove Mothership Orchestra and our Canberra International Music Festival’s Young Composer Competition. This girl’s got talent! Best of luck, Sally, and keep in touch. It was Greek tragedy that took my Saturday night this week: Agamemnon. It’s the first of a trilogy of plays by Aeschylus based around the Trojan War. The Trojan War and the Gods and various internecine murders and seductions seem to be the staple of Ancient Greek theatre, and this was one good example. 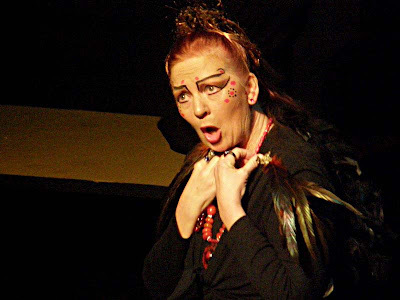 The cast includes a wise old woman, the Furies, Clytemnestra the queen, King Agamemnon the king and the seer Cassandra. Clytemnestra has been awaiting the King’s return for 10 years, while he’s been off achieving manly victory over Troy. She’s led the city, Argos, for that time and become powerful and independent. She awaits his return to seek revenge for his sacrificing of their daughter for good luck in the war effort. He returns with Cassandra, beautiful daughter of Priam, the dead Trojan king, but now slave and concubine, and Clytemnestra does them both in. The parting scene sees Clytemnestra confusing Cassandra’s return as a ghost with her own daughter. It was a small, local amateur production, but well presented and easy to follow. 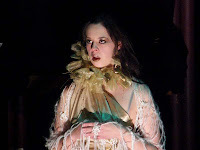 It had been rewritten (with "a great many liberties") by one of the production group, Rachel Hogan of WeThree, into modern English from various English translations. Megan and I found it powerful, surprisingly feminist (it’s not the only Greek play from a woman’s point of view) and a very worthy effort from the group. 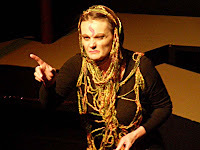 Surprisingly for me, Clytemnestra turned out to be played by a workmate, Jenna Arnold, so there was a personal connection, too. For the sake of CJ, I should give this a jazz twist. I can think of two. 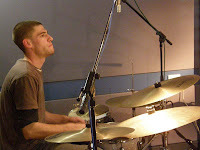 Firstly, Alex Johnson, one of the musical contributors, is currently a third year student at the Jazz School. Secondly, a favourite blues of mine is The prophet of doom, sung by Cassandra Wilson, on David Murray’s fabulous album, Sacred ground. The prophet of doom is the Cassandra of this very story: “My name is Cassandra, daughter of Hecuba, priestess of Athena, student of Apollo, sister of Paris, they call me the prophet of doom” … “never think that because you’re a god, every girl will put out for you”. That's a nice line for the girls! It was much enjoyed; small and intimate and local theatre. Recommended. There are still some performances on 17-20 June at the Belconnen Community Theatre; for tickets phone 6251 2981. 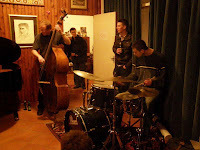 Tom Vincent and his newly minted trio played for a house concert for family and friends, so the reference to Oscar Peterson and the Exclusively for my friends series is obvious enough. 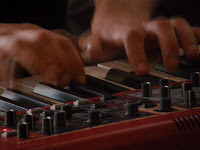 Tom’s a pianist, after all, although in a much broader and fluid and more modern style than Oscar. But the sound in the room was clear and crisp and reminded me of the sound of those records. 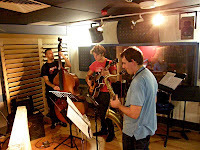 And it was a fully acoustic outing: baby grand and unamplified double bass with the volume to (mostly) match it with Mark Sutton, who can be quite powerful when he chooses, and Tom who was hugely and dramatically dynamic and often just plain loud. And it was a wonderful performance. Tom led with a mashup of standards and jazz tunes, mostly unannounced and picked up with stunning facility by Leigh and also by Mark (but then drummers can do that more easily: no chords). There were plenty of Monk tunes, and some soggy standards like Foggy day and All of me, and they played Jitterbug waltz, which is a favourite of mine. There was some modern stuff there, too. Coltrane’s Love Supreme got a toe in with Resolution. These were all mixed together so that I overheard Carl quip “another seque; we must have heard 300 tunes tonight”. An exaggeration, but this was stunning fluidity and playfulness and a readiness to cover the waterfront of jazz history. But the witticism and capability had everyone chuckling as another melody appeared unexpectedly. And it was not just masses of tunes, but also massive fluidity over all parts of the music: rhythms moved all over the place. Polyrhythms between hands, bass line triplets and delayed lines, drums capably moving with all this. Melodies that were dissonantly sideshifted or restructured lines with the same form but altered intervals and pitches. A pianist noted that Tom has a big hand, so could play big, unusual chords in his left hand, but they were extensions and colours that we were hearing, as well as intervals. Busy and dynamic and expressive and playful. 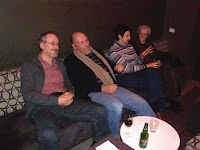 A wonderful night, in from a very cold Canberra night, with an open fire, exclusively for friends. 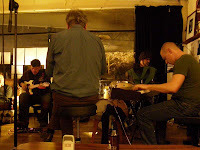 There was also a free jazz intro from Jono Lake (piano) and Shane Spellman (trumpet) and householder John Wilton sat in on drums for one tune. Sorry, no pics of Jono or Shane. 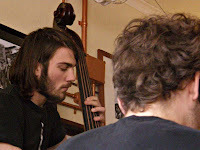 I also caught Leigh and Mark playing with James LeFevre when I was out and about in Manuka the following afternoon. I’ve put in a few pics of that, too. I only heard a tune or two, but it was lively and capable. And Leigh’s parents, Bill and Celeste, were there with a few friends of mine: small world. It was a fabulous night. 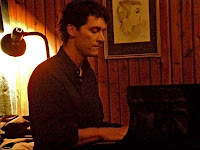 Tom Vincent (Hobart-based piano) led a trio with collaborator Leigh Barker (acoustic bass, ex-Canberra, now based in Melbourne) and first-time member, Mark Sutton (drums). 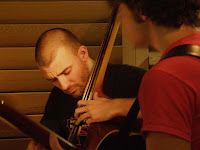 I enjoy the chordless trio format, but James LeFevre and Hannah James took this one step further yesterday at Minque when they played as a duo of tenor and bass. This format not just harmonically open, but also rhythmically open. Being so open, it’s demanding on both instruments. They both must state or at least imply the harmonic movement, but they also must both take rhythmic roles. Neither of these are new for the bass, but the openness does give it unusual space for play. And for the sax, there’s a groove-stating role which is not too commonly used elsewhere, and also a space of delightful clarity of sound, given the very different sonorities and pitches of the bass and tenor. So I was looking forward to Hannah and James in this duo format. I wasn’t disappointed. Hannah remarked on the openness and space. 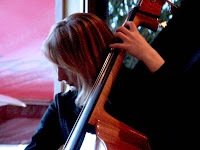 It was a busier and more playful Hannah I heard in the duo: good strong statements of the grooves, with the nuances clear to hear, and busy fills and plenty of solos, and a readiness to move over the fingerboard into thumb positions. Her tone was both rich in high end, and deep. She’s talking of another cabinet for a stronger and punchier middle, but this thinner sound worked for the duo format. James was in his element, too. I’ve been impressed recently by the authority James has been showing in performance. There’s often a blues edge and full tone, and this suited the groove-stating horn lines backing Hannah’s solos. I thought of ensemble-formed discipline, which develops amongst horn players with experience of big bands and the like. But there’s also plenty of knowledge to depart from staid lines and harmonies and venture into flurries and out passages. The tunes were the known Real Book repertoire of standards and latins and jazz tunes: a few Monk tunes and Miles and Shorter and Jobim and the luscious American songbook. Nothing unusual, but open and clear, and lots of room to move and play. Much enjoyed by me, but also by a small but nicely appreciative crowd. 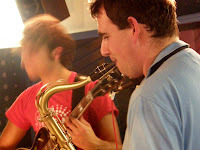 James puts on different bands each week at Minque, so get down to Manuka on Saturday afternoons and support the gig. Free entry and cheap drinks. 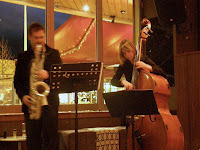 James LeFevre (tenor) played a duo set with Hannah James (bass). Dave, Bill and Ed returned to ArtSound, this time with Sebastian, for an outing with their originals band, Quantum Theory. 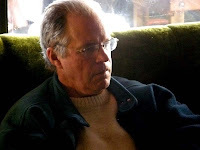 I wrote of the Dave, Bill and Ed trio broadcasting only two weeks ago. 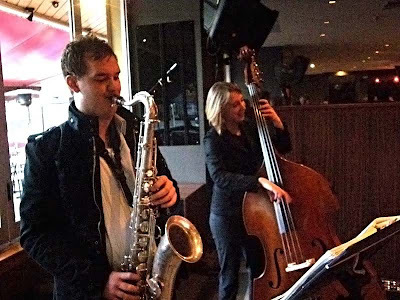 They played pure and refined sets of standards, as is their way at their Belgian Beer Café residency. 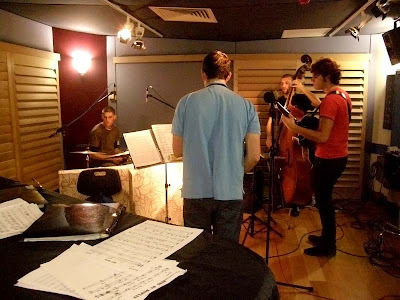 They get lots of practice there, and it’s evident in their smooth, but worthy, interpretations of the standards repertoire. 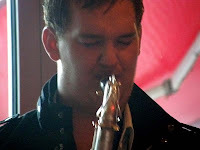 But the trio also reincarnates as Quantum Theory with Sebastian McIntosh on sax. They played a wonderful set at Jazz Uncovered, performing a transcription of James Muller’s album, Thrum. This night at ArtSound included a couple from that set, along with a few modern standouts, Wayne Shorter’s Fee Fi Fo Fum, Jerry Bergonzi, In a sentimental mood, and Miles’ Seven steps to Heaven. But the main features were originals, by Sebastian and Dave. I was amused by the first title, Dave’s Ambiguous stomach feeling. The tune itself was not at all upsetting, being a steady, unison melody dropping into blues solos. Sebastian’s M was a lively swing, which eminently suits Bill and Ed. Ang Street (?) was slow and thoughtful; Where is Mr Heisenberg was offered to Physics geeks (obviously University banter) and was lively and richly syncopated. Dave’s Where are we going was another modern melody-rich piece and a nice vehicle for bass. These are an easily identifiable outfit. Ed is busy and precise and committed. 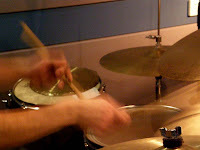 Bill is similarly committed, swinging with a solid groove and soloing with clear melodic intent. Dave is the distilled, clean guitarist, so unlike the many busy players on his instrument. Sebastian speaks intelligently on tenor, imploring and pleading and often falling into sprays of a-rhythmic notes and extended dissonance. Two sides of a coin: the standards trio, and the modern originals outfit. 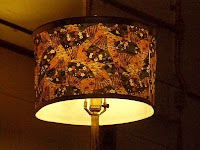 I really can’t claim to have a preference – they are both central to the styles that I love. 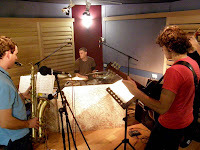 Quantum Theory comprises Sebastian McIntosh (sax), Dave Rodriguez (guitar), Bill Williams (bass) and Ed Rodrigues (drums). They broadcast from ArtSound’s studio for Friday Night Live.